A spring run Chinook in the Salmon River. A first step in protecting Klamath–Trinity spring run Chinook as a separate species took place this week with the California Fish and Game Commission making the fish a candidate for an endangered species listing in the state. That includes fishing restrictions but the release notes that the tribe and the council want to work with fishermen and the agency for “common sense” regulations. "There is a population of hatchery born spring Chinook on the Trinity River that can and should be fished," Karuk Tribe Executive Director Joshua Saxon said in the release. With spring run teetering on the brink of extinction, the tribe and SRRC have pushed for a state and federal listing, finally backed with DNA evidence that shows the fall and spring Chinook runs are genetically different. Aiding in the research done by University of California at Davis scientists was a cache of old fish bones — some dating back 5,000 years — found in a cave nestled in the Upper Klamath Basin. While the spring run Chinook once made their way into those cool, deep waters in the far-flung reaches of the basin, the fish are now blocked by a series of dams, which are slated for removal in the largest project of its kind — with work slated to begin in 2020. Meanwhile, the hope is the springers can hang on until the walls come down. "These fish have been on the brink of extinction for years," Saxon said, "but no one believed us when we said they were a distinct species from fall Chinook until now." (CESA). The decision was in response to a petition filed last year by the Karuk Tribe and the Salmon River Restoration Council. 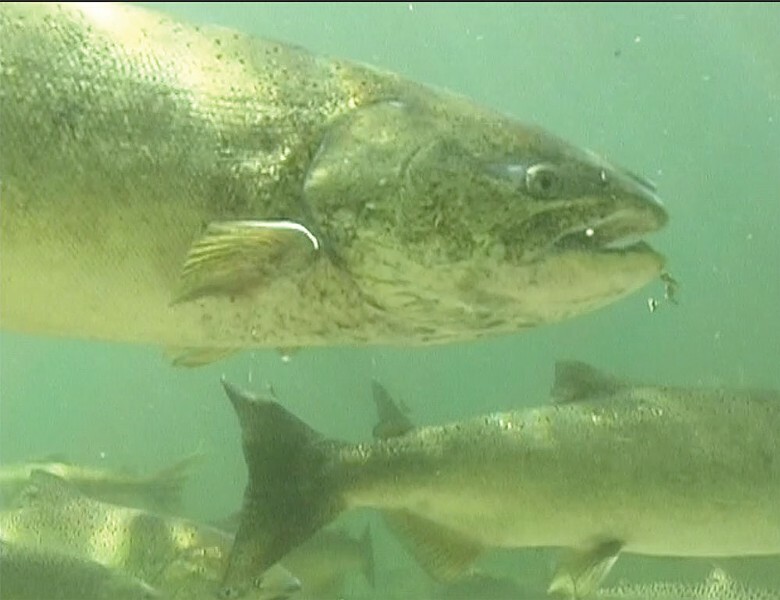 A final decision to list the species will be made within 12 months; in the meantime, Klamath-Trinity Spring Chinook will be afforded all the protections of a listed species. The move by the Fish and Game Commission forces California to restrict fishing to protect the fish, however, the Tribe and SRRC want to work with fishermen and the agency to develop common sense fishing regulations. “There is a population of hatchery born spring Chinook on the Trinity River that can and should be fished,” says Karuk Tribe Executive Director Joshua Saxon. Researchers at the University of California, Davis led by Dr. Michael Miller, recently published two reports in the journal Science Advances and the Proceedings of the National Academy of Sciences that explain the genetic differences between fall Chinook and spring Chinook. The research provides new insights into salmon evolution and reveals that spring Chinook salmon deserve to be treated as its own evolutionarily distinct unit separate from fall Chinook. Before the age of dams, industrial mining, and clear-cut logging, spring Chinook salmon were the most abundant run of salmon in many Pacific Northwest Rivers. Today these fish are nearly extinct throughout much of their historic range. Spring Chinook enter rivers in the spring when snow melt swells rivers allowing the fish to travel into the upper reaches of a watershed. Then they must reside in cold water areas all summer until they spawn and die in the fall. Fall Chinook migrate into rivers in the fall where they spawn and die relatively soon after entering fresh water. Having two life strategies allow Chinook to take advantage of the entire watershed instead of just the upper or lower reaches. This behavioral diversity enhances the chances of long-term survival for the entire population. “Dams are the single greatest threat to spring Chinook,” explains Karuna Greenberg of the Salmon River Restoration Council. “Dams prevent Springers from accessing the upper reaches of watersheds where most of the cold-water habitat they need to survive the summer is located.” Greenberg cites mining, diversions, and poor forest management practices as additional factors. Miller’s findings contrast with the previously held notion that salmon populations evolved the spring run behavior many times across multiple watersheds. If that were true, it would mean that the spring run behavior is relatively easy for Chinook to develop. In the past, federal agencies have declined to add spring Chinook to the Endangered Species List for this very reason. “This new finding is forcing agencies to reconsider their stance on spring Chinook in the Klamath and many other watersheds,” says Tucker. The genetic difference between spring and fall Chinook is in a gene called Greb1L which has been shown to play a role in fat metabolism. This makes sense to Saxon. “We can taste the difference. Springers have a long way to swim before reaching their spawning grounds so they enter the river full of body fat which is why they taste so good.” Spring Chinook typically have 30% more body fat than fall Chinook. The population of Chinook salmon that swims up the Klamath River in the spring once numbered in the hundreds of thousands. Last summer, divers at the Salmon River Cooperative Spring Chinook and Summer Steelhead Population Snorkel Survey only found 188 spring-run Chinook, which is the fifth lowest return in over 28 years since the counts started. Divers found only 14 spring Chinook on the South Fork of the Trinity River, another location of a remnant population of wild spring Salmon in the Klamath-Trinity River system. A similar petition to list Klamath Trinity Spring Chinook under the federal Endangered Species Act is currently under review. Spring Chinook advocates currently have January 2021 circled on their calendars. That’s when the removal of the lower four Klamath River dams is slated to begin pursuant to an historic agreement between dam owner PacifiCorp, California, Oregon, Tribes, and conservation groups. The project would be the largest salmon restoration project in US history. For spring Chinook and the Karuk Tribe, it can’t come soon enough.